Karla & Ben’s enchanted wedding was a magical day filled with love and happiness. Gorgeous bride Karla stunned in her Harmony gown by Mori Lee from White Lily Couture. Karla’s dramatic gown was the perfect choice for her special day, the sweetheart gown featured stunning lace detailing with a scalloped edge train. She paired her gown with silver heels, loose waves and understated jewellery. This intricate, yet simple look provided the perfect pairing with the pops of deep red found throughout the occasion. Although white and red is a classic colour combination, Karla and Ben took it to a different level. 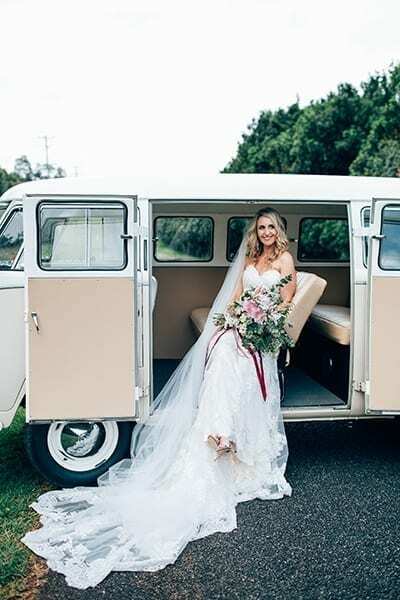 The effect was romantic with a red sash around her soft Australian native bouquet, red rose petals and splashes of red throughout the reception. The September wedding included an intimate ceremony, fun-filled reception, and even a kombi van! Their beloved dog also turned up to the ceremony looking very dapper in his leather bow tie! We wish the couple all the happiness in the world.